Guys, do you ever wonder if you say the wrong thing when you’re around women? Do you sometimes feel like you just don’t know what to say or how to act? Would you like to learn how to get allow better with your wife or that special woman in your life? Having a better relationship with the woman in your life is easy…once you know a few key points. 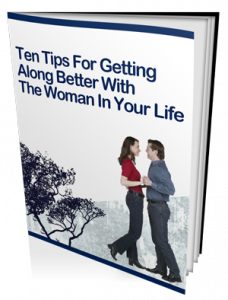 Sign up for our free guide “Ten Tips For Getting Along Better With The Woman In Your Life” and you’ll find tips to help you build a better relationship with the woman in your life. The one thing to avoid that causes 56% of divorce cases! To get the free guide, complete the form to the right!